So, it seems that I've been gone for quite some time. Honestly, things have been crazy around here. My first book is in the pre-production stages and I've been completely swamped with getting it ready. Of course, I can't work ALL the time. Sometimes I have to take breaks and/or procrastinate and let my brain relax. Break taking inevitably leads to taking a quiz about which Harry Potter character you are. I've always felt like a Luna Lovegood and that's exactly what I got. The thing that surprised me was that when I put my result on Facebook, everyone else felt obliged to comment on how I'm so obviously a Luna. Apparently I might as well just be walking around in radish earrings and spectrespecs. I guess part of my Luna-ness is not really understanding/caring how other people see me. I felt pretty proud of myself when I came up with these things so I figured, why not sort everyone else into their houses? 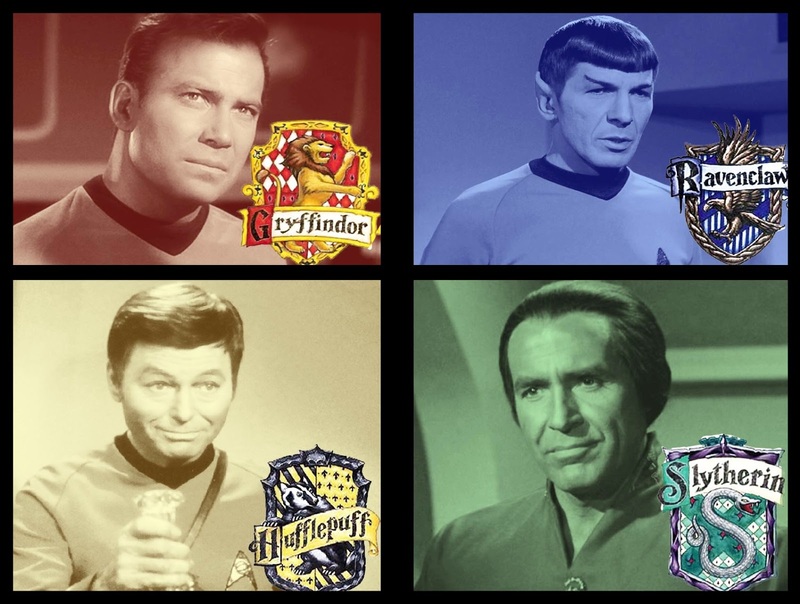 Honestly, pretty much everyone under the Spock/Kirk/McCoy trifecta can either be sorted into Gryffindor or Huffelpuff but whatever. I put Scotty in Slytherin because he jumps to defend the honor of the Enterprise but not the captain, he's rather cunning, and he tends to purposely over-estimate the amount of time it'll take to fix things to get Kirk off his back. Uhura's like, crazy smart and talented. Sulu ends up being a superb starship captain. And Chekov is Chekov. He's basically the most Huffelpuffy Huffelpuff of the 23rd century. I started thinking about the rest of the series, too. What do you think? Any Star-Potters/Potter-Trekker/Potter-ies out there have ideas about how to sort TNG-Enterprise? Riker oozes Gryffindor; Dr. Crusher is Hufflepuff (I think a lot of doctors probably sort into Hufflepuff- The Doctor being a notable exception); Although Picard has quite a few Gryffindor characteristics, I'm putting him in Ravenclaw- I think that's where he leans most. 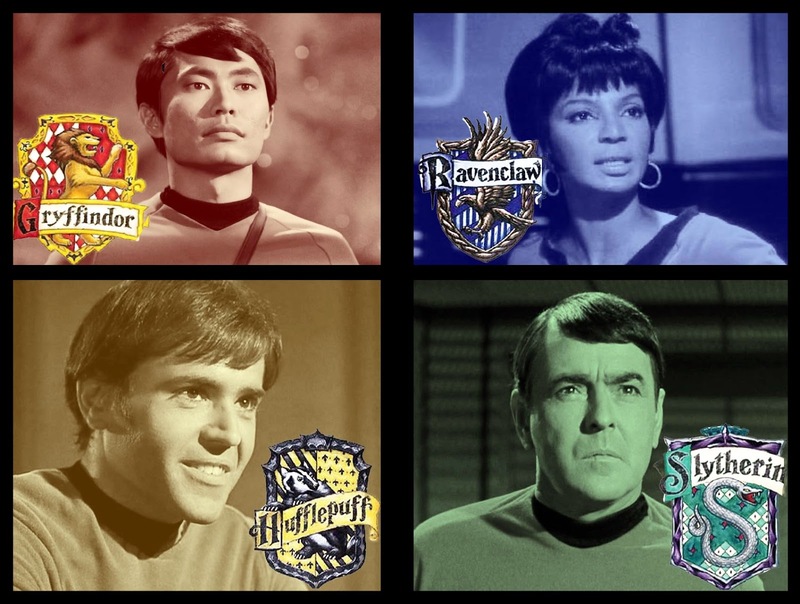 As for Slytherin- we don't have to stick to main characters, do we? Commander Shelby is my Slytherin- sly, cunning, & oh so ambitious! LOVE THIS POST!! Oh, I hope you do more! 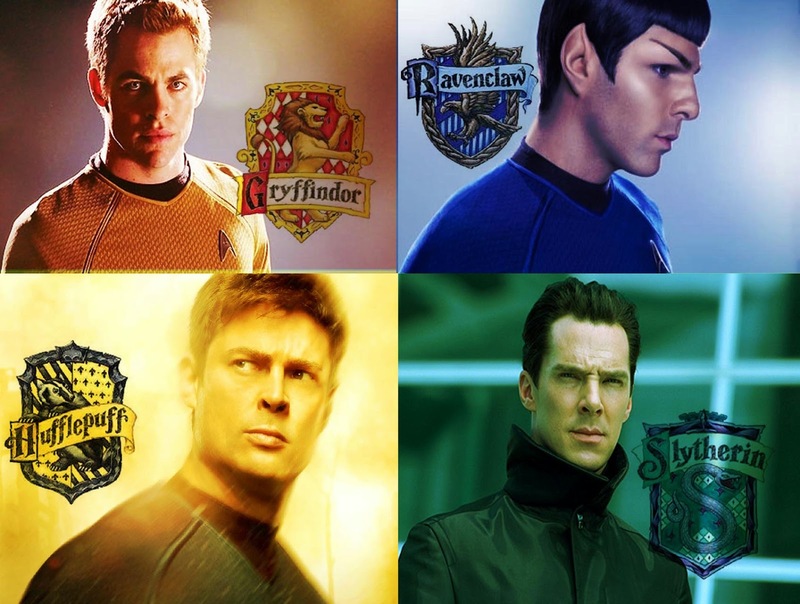 My husband and I do this sort of thing for fun, sorting various characters into Hogwarts houses or D&D alignments, etc. I'm pretty sure we've done it for the whole crew of Voyager and DS9! What were your results, Kelley? We need to know! I hadn't thought about Scotty that way, but you make a really good point!